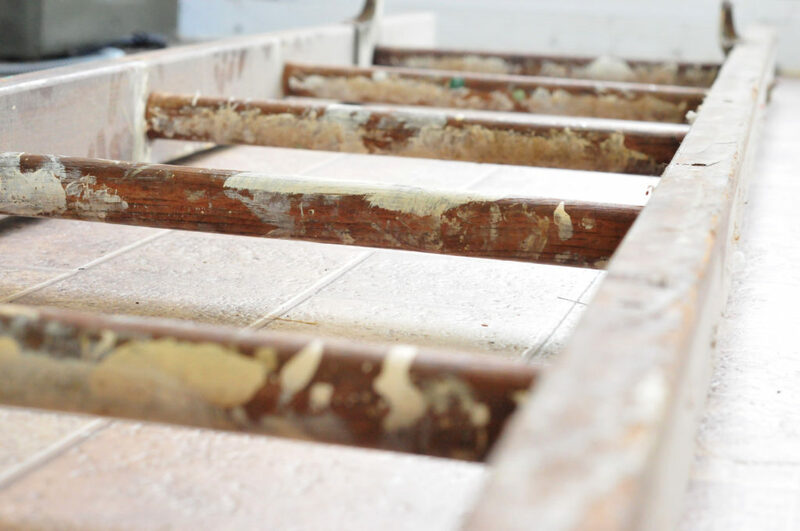 It’s no secret that I love antiques — not the really pretty ones that have been kept in great shape with beautifully lacquered cherry wood, but the rustic, beat up kind that have tons of character (and sometimes cobwebs … ew). I posted this gorgeous (and rusted) vintage scale I found on my most recent flea market trip to Versailles on our Instagram and Facebook feeds recently, and let me just tell you that finding it made. my. day. 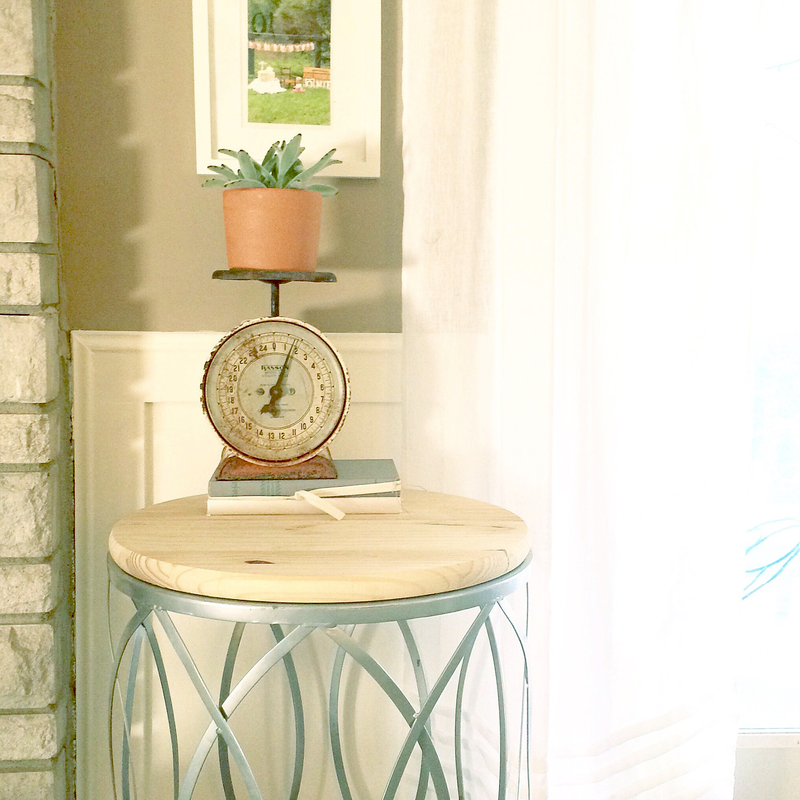 My husband would probably say I love junk, but hey, one man’s trash is another man’s treasure! 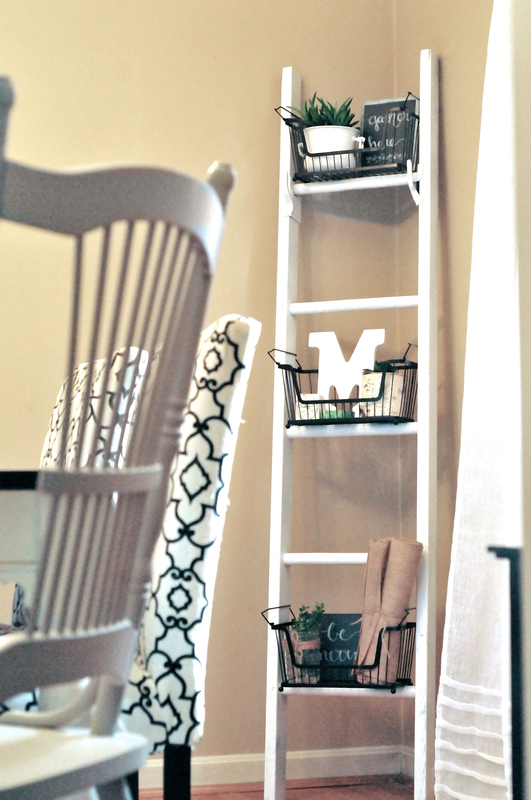 I’ve been crushing lately on using unusual items as home decor, like ladders, for instance. 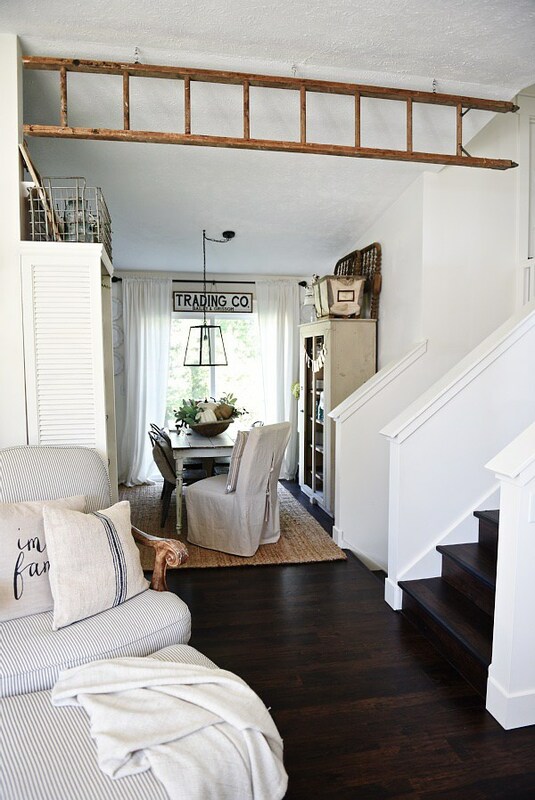 When I saw this post from Liz Marie Blog, I was floored because I had never thought of putting a ladder in my home on display except as a blanket ladder. You can absolutely buy these, and they are stunning. Some of my favorites can be found here, here and here, but have you seen those prices!?! If you can afford it, great! If you’re like me and can’t, I have a solution! You can make your own! No power tools required. And, if that wasn’t awesome enough, you can customize it to your liking. I really wanted white, not stained and definitely not black. So break out the spray paint! 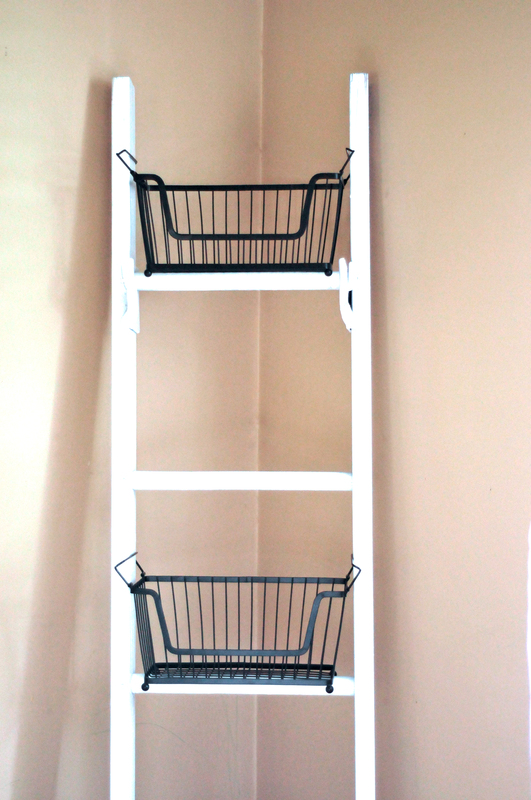 When we moved into our house over 11 years ago, the previous owners left a bunch of random items (some awesome, like an old wooden extension ladder and a map of the city; some not so awesome, like a disco ball and crutches), and I finally figured out what to do with the extension ladder! 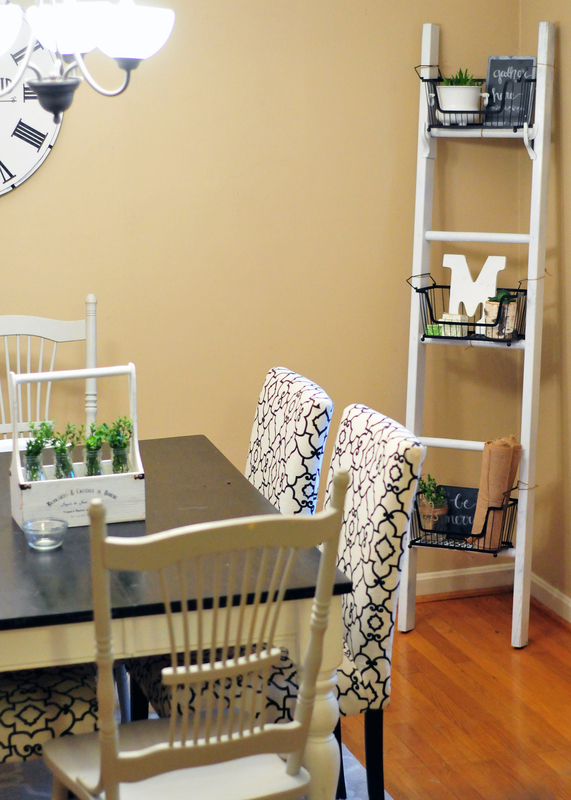 It was a bit rickety, so I wouldn’t exactly put my life in its hands, but it makes a beautiful storage ladder for our dining room! 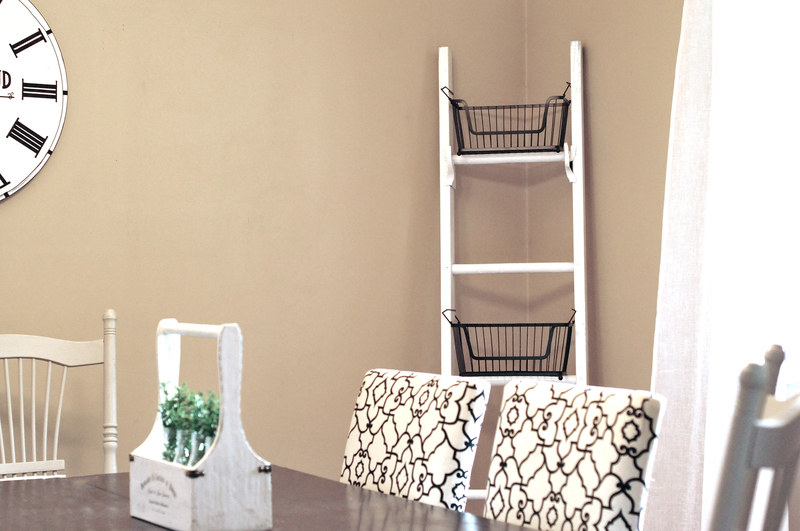 The first step is acquiring the materials, mainly a ladder. We got lucky having ours in the basement already, but I have seen plenty of these at antique shops, salvage yards, on the side of the road, thrift stores, etc. Any ladder will do. 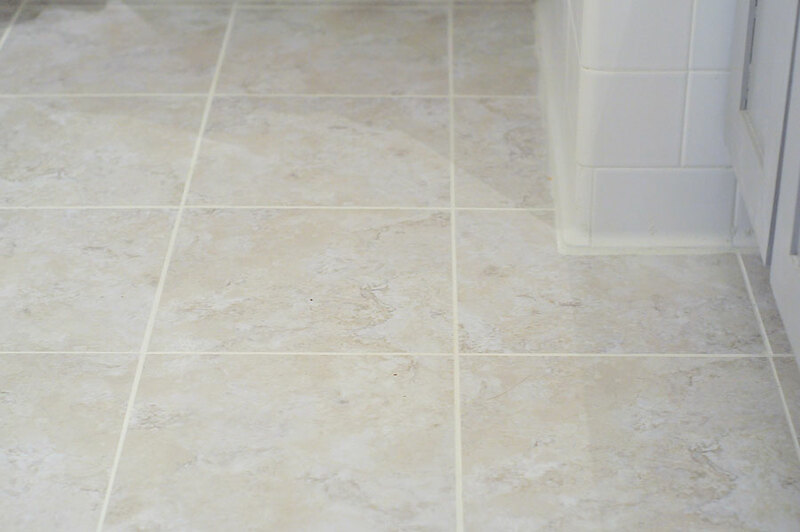 Mine had round rungs, but you can use flat ones as well! 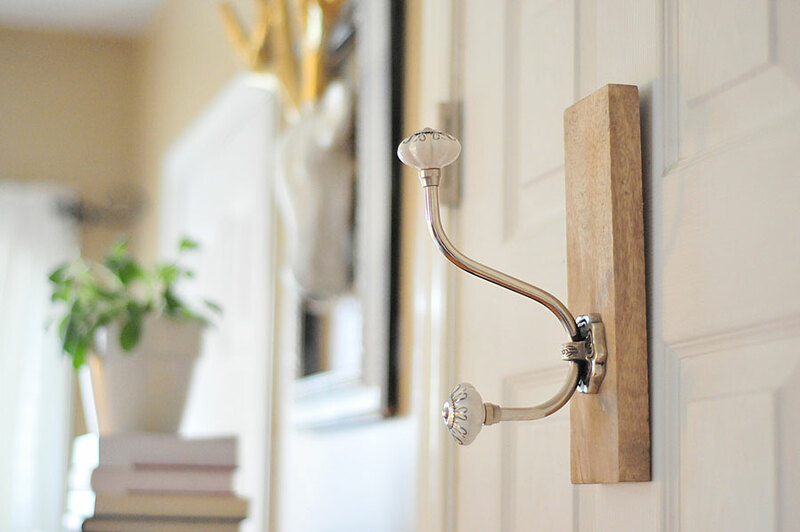 The beauty of these are they’re all different, and a lot of the antique ones are connected with metal pieces you can incorporate into the finished look. Mine was an extension ladder, and these metal hooks held the two sides of the ladder in place. I loved the way they looked, so I left them on. 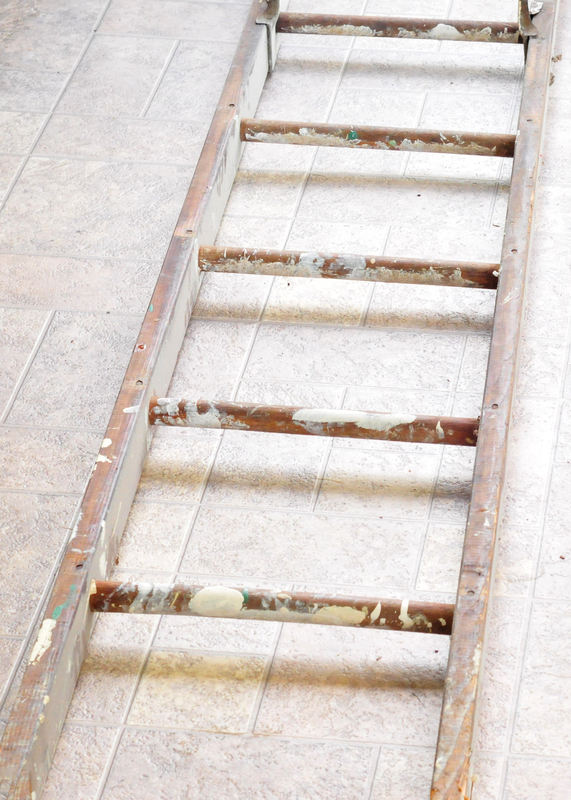 Once you have your ladder, give it a light sanding, wipe it down with a wet cloth and let it dry. 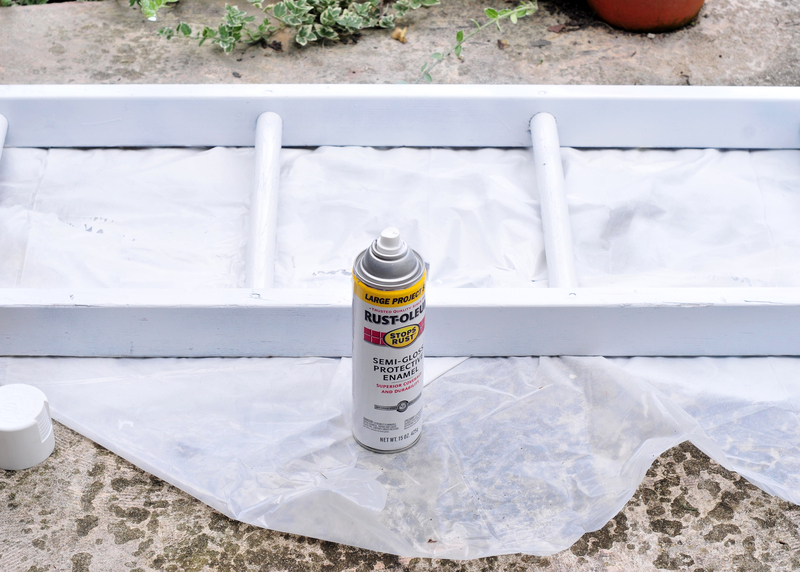 Then paint or stain it to your liking. 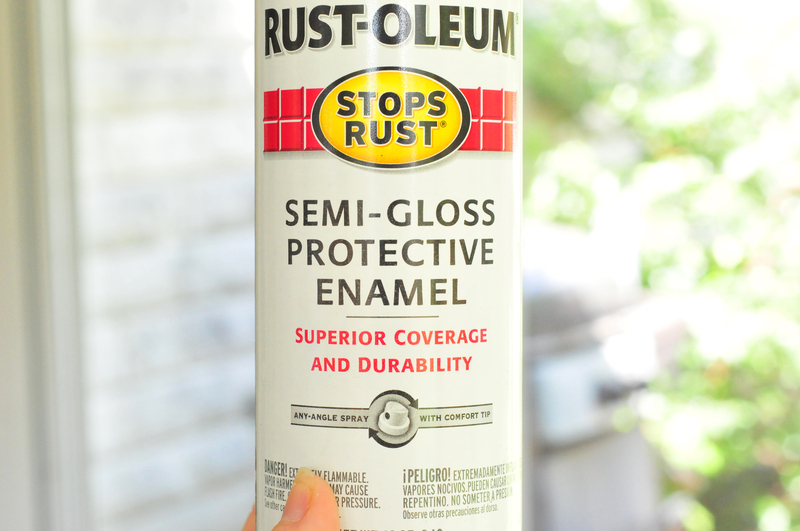 I used Rustoleum semi-gloss bright white enamel. 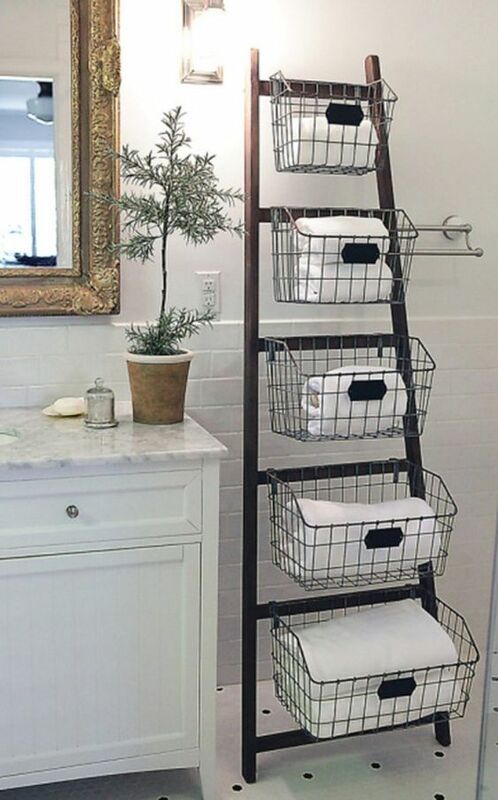 Next, add your baskets. I found these hanging baskets at Big Lots, but I’ve seen them at Walmart and various other places, usually in the kitchen section. Before I go on, let me tell you a funny story. These baskets have a built in edge to them that hooked just perfectly around the back of my ladder. Yay! So I thought, Great, I won’t have to screw these in or anything! 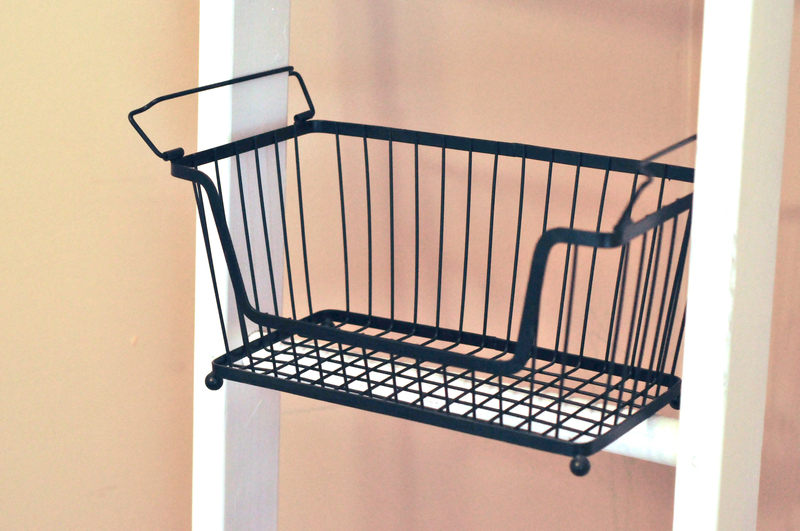 I got all the baskets set on the rungs, filled them with goodies and took some photos. Not two minutes later, I hear a crash and come in the dining room to find everything — I mean, EVERYTHING — on the floor thanks to a toddler who tried to climb the ladder and the “stuff was in [her] way”. So note to self, if you have a toddler or a cat or anything/one else who might try to climb said ladder, I would strongly urge you to anchor those baskets down. 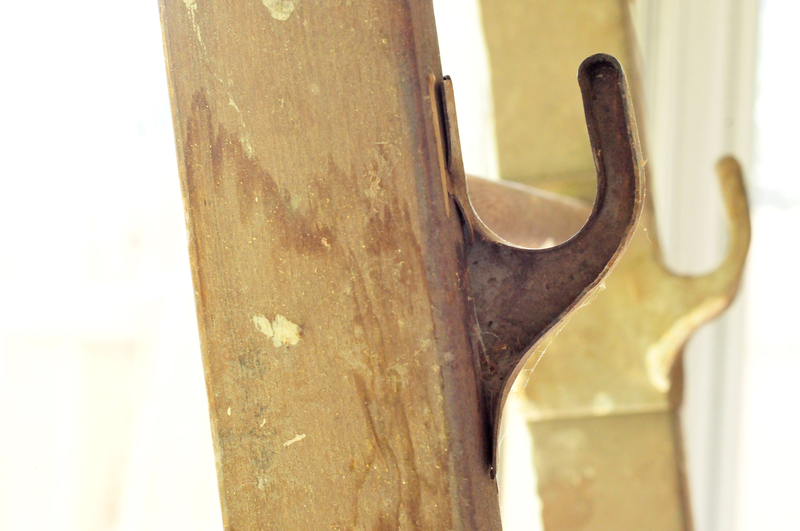 I bought some old iron S-hooks from an antique shop in Versailles that I had originally intended to use. However, they were too large for my rungs, so I ended up using twine to tie the baskets down on the bottom and both sides. It worked like a charm. I am proud to say the ladder has been up for a few days now with no further, um, incidents. 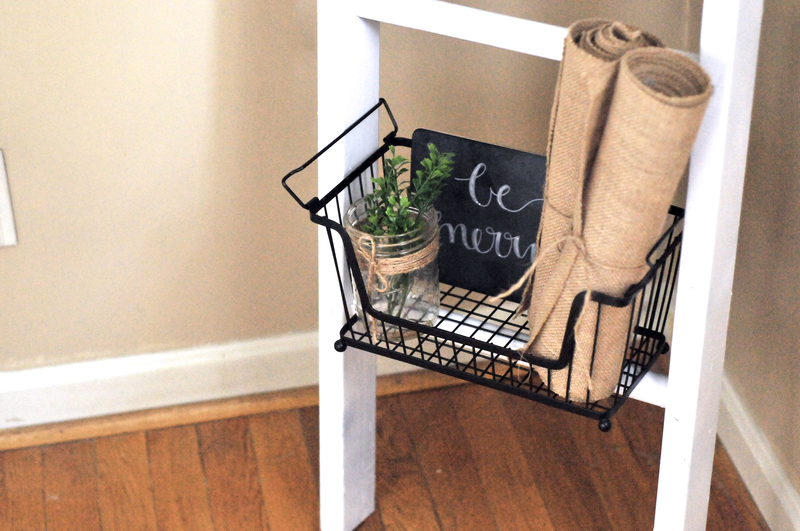 Once your baskets are all set, gather some plants, old books, chalkboard signs and anything else you might want to put in your baskets and decorate away! 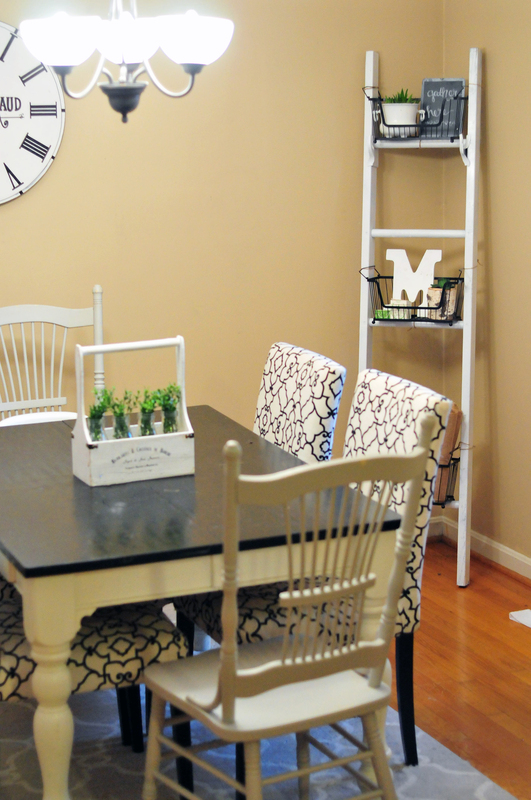 This project took just under 30 minutes including dry time for the paint, and is one of my favorite pieces in the dining room now! If you make your own, we’d love to see your photo on Instagram! Just use #sharingallthelovelythings. Happy Tuesday!